Are you and your family protected from fires, smoke or carbon monoxide? Do you have the smoke detectors installed? Are they installed in the right places and do you have enough? All three questions are as equally important. When it comes to protection, we can’t emphasize enough how important it is to have smoke and carbon monoxide detectors installed in your home and installed the correct places. We have seen to many homes in Birmingham not have smoke and carbon detectors. With that said I would like to tell you a bit about smoke and carbon monoxide. Did you know that most people that die in a house fire, dies from the smoke not because they were consumed by the fire? What’s even worse is this happens in their sleep, and if they do wake up, there is not enough time to escape the smoke that has consumed them. They have already breathed too much smoke, and the smoke can be so intense and thick you can’t see where you are going. If you are ever in a fire the best thing, you can do go to ground and crawl out as fast as you can to safety. Carbon Monoxide is the known as the silent killer. Carbon Monoxide is dangerous because it’s colorless, odorless and a tasteless gas. Carbon Monoxide poisoning can cause severe illness, permanent health problems and even death? Carbon monoxide is found in many household appliances, including gas stoves, dryers, water heaters, and furnaces and gas or wood fireplaces. If items like these are in poorly ventilated areas, carbon monoxide can build up and be deadly. Now that we know of the risks I’m going to tell you how you avoid these problems and keep your loved ones, yourself and your home safe. Installing smoke detectors, alarms and carbon monoxide detectors in your home is the best prevention. Detectors will alert you and your family in the early stages of fire, smoke or a carbon monoxide threat if they are installed correctly and properly maintained. 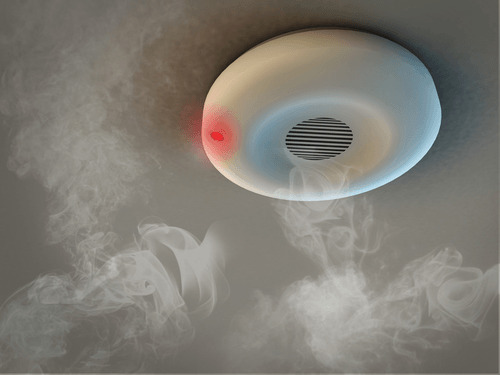 Smoke and carbon detectors should be interconnected with each other and to your electrical system. Interconnected means: that all smoke detectors will communicate with each other in the event of an emergency. If there is a problem in the 2nd bedroom, you will know it in the master bedroom and vice versa. Smoke detectors should also have battery backup. In the event that you lose power the detectors will still work for a short period of time. Smoke detectors should be checked every few weeks to make sure they are performing and functioning correctly. Batteries should be changed out frequently too. Death and injury can be avoided by taking just a few steps. If you do not have smoke detectors or carbon Monoxide detectors, please give the safety experts at John's Electric a call today. If you have any questions or concerns about your existing smoke detectors or need monthly maintenance, please give us a call. Again, your safety is our number-one concern. Please call John's Electric today, and we will make sure that your home has the correct number, placement and type of smoke detectors to safeguard your family.